Oricium is a fast, lateral scrolling shoot-em-up with a touch of puzzle game. Its difficulty curve is smooth, so it is easy to go through the first levels. However it quickly becomes challenging, so don't judge it just after playing 5 minutes. Oricium started as an experiment to see if it was possible to produce a fast scrolling game, including details such as masked sprites, animations, pseudo-paralax scrolling, many simultaneous enemies, fast action, and many more. 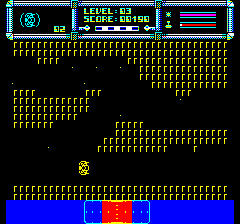 Of course the first inspiration came from the well-known Andrew Braybrook’s game Uridium, but soon the gameplay departed from the original. Oricium is quite a complex game, including (for the first time) synchronization with the screen refresh, and procedural generation for the dreadnaughts and other scenes. That is why it has the amazing number of 42 different levels. A huge effort was put in many small details (graphics, music, sfx, animations…) to make the game look professional and also make the player smile from time to time if possible. the signals and analyzed them. And suddenly, after more than a decade, the signals stopped. The inter-dimensional veil had got thick again. And they decoded the information. And learnt about our way of life, about our nature, about our fears… and planned our invasion. To be able to interact with our dimension, they had to adopt a physical shape. And they chose the form of which they considered our deepest horrors. And they patiently waited for nearly three decades for the veil to become thin again. When the attack was detected, the Earth nations united their forces and launched all our weaponry, just to find out that the enemy ships were shielded against it. The counter-attack was futile, but the engineers found out that they created their dreadnaughts with a weak spot: a small ship could avoid their defenses, maneuver through the surface, and de-activate their shielding. Nobody understood the weak design, but it was an opportunity to survive. The Earth Forces designed a machine that could launch an energy beam to the enemy dreadnaughts and send them back to their dimension. But their shielding had to be neutralized first. You are selected as volunteer to take this mission. You will have to pilot your skimmer and maneuver through the surface of the enemy dreadnaughts, facing all the perils and horrors they launch at you, with the only objective of de-activating their shielding. To play this game, you need an Oric system1 with a tape drive unit, or an emulator2 providing the equivalent feature set. 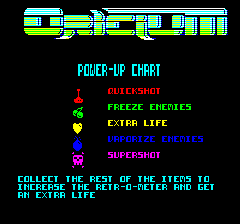 As Oricium runs synchronized with the vertical screen retrace, you'll get the best experience by playing it on a real machine and a TV. As the Oric does not offer any built-in capability to achieve this, you'll have to manually calibrate the timing before playing. If you use an emulator please be sure to use one with support of full raster emulation in the video code, such as Oricutron. Oricium also supports the mod that takes the VSync signal from the RGB port and feeds it through the Tape-in pin in the tape connector (this mod is also emulated in Oricutron). This idea first appeared at Fabrice Frances' site. Again, read the instructions for information about how to use this mod, or manually calibrate the vertical retrace timing. 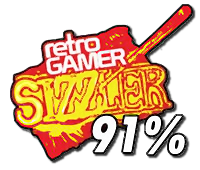 The zipped file contains a readme file, the game instructions and the game in three different formats: a tape image file (tap), a disk image file (dsk) that can be transferred to a physical disc and a wav file with ultrafast cassette loading. BEWARE: the latter only works with ATMOS roms. 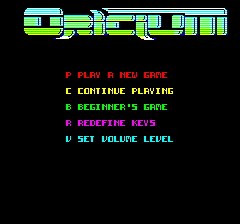 The readme file includes instructions on how to load the game in your real Oric machine. Please read the manual for further instructions. Version 1.2Included the patches from version 1.1. Also added a "PRESS A KEY" message after loading and while the presentation screen is visible, giving time to the user to stop the player. This solved an issue where some players were creating sound artifacts after loading the game in ultra fast mode which were, in turn, confused with the pressence of the VSync hack. WIP version hacked so it loads on Oric-1. Also version 1.0 tap file had some different headers in the tap files which, though valid, were creating problems in Euphoric and similar emulators. This has also been solved. We are aware of an issue when loading from tape on an Oric-1. After loading the presentation screen the Oric return to the prompt (though it is not visible, as ink and paper are both black). There may be some workarounds, but the easiest one is: stop the tape player, type (blindly) CLOAD"" and restart the tape so it continues loading. Will be solved in the next release. 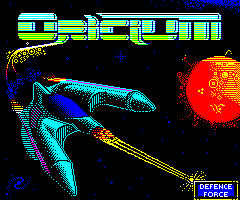 This game would have never seen the light without the help of the Oric community. Thanks to Dbug, Symoon, Godzil, Greymagick and Fabrice for the tests of the Alpha versions and for providing insights and ideas, as well as always giving me energy to complete this game. Thanks too to the people in RetroWiki for their help, support and nice comments. Specially to Silicebit for his counter routine, and dancresp and ron for their feedback and courage during the beta testing stage. And also thanks to Twilighte, as he was always a source of inspiration. Rest in peace; we’ll always remember you. If you like the game, if you have questions, if you want to post encouragement messages or suggestions, feel free to register on the Defence-Force forums and post your message there. It is always good to receive feedback and encourage programmers to keep on developing new things for our old machines. The game includes a lot of references (some trivial, some hidden) to the culture back in the 80s, so it would be nice to see how many of those you can spot! This game has been written by fans, for the fans. The game is entirely free, but any distribution should include the game (in whatever format, tap, ort or dsk) alongside with the readme.txt file and the instructions contained in Oricium.pdf. Please include a link to this website if you put the game for downloading in your own site or forum.